Socionext provides interface macros that are optimized for various applications to help its customers develop advanced SoCs. With a transmission performance of 10Gbps-28Gbps per channel and configuration comprising of multiple channels, our high-performance SerDes macro is appropriate for 100G/200G/400G optical networks or 100G Ethernet systems. The built-in low-jitter, high-performance PLL enables robust transmission up to 28Gbps per channel. The interface also supports various standards including OIF-CEI-11G-SR, OIF-CEI-28G-SR, OIF-CEI-28G-VSR, IEEE802.3ba CAUI4, and XFI. Comprising of Transmitter/Receiver/PLL and capable of bidirectional communication with 1 macro. Up to 112.8Gps per macro (for unidirectional, ×4 configuration). Power-down control on each lane supported. Power-down control for the entire macro supported. Controller for maximizing high DRAM utilization. High performance QoS-Arbiter featuring multiple functions. Original low power consumption bus with high layout flexibility. Visualizes memory system performance in real-time. Monitors performance (bandwidth, latency) and provides an environment for tuning parameters. Our various DDR interface macros range from low and middle speed, forwarding bandwidth to high-speed, forwarding bandwidth or low power, with our various process technologies. Moreover, we support custom SoC development by LSI package board co-design. Compatible with many different DRAM configurations and PKG options, such as Fly-by or PoP, by PHY function (training function). The significant improvement of CPU processing capability and the increasing need for large-size data transmission make it difficult to achieve the expected architecture performance with the existing bus. PCI Express technology is a high-speed interface that enables data transmission of several hundreds of megabytes. Our PCI Express macro is applicable to maximum of 8 GT/s (Gen3). 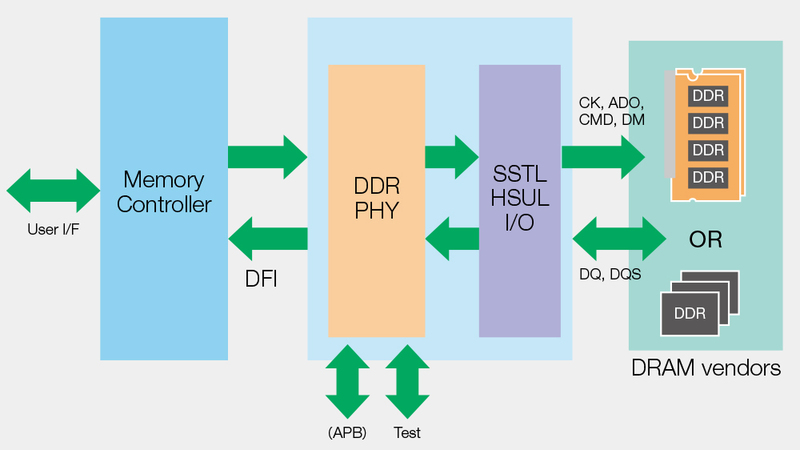 It has passed the PCI Express standard compliance test sponsored by PCI-SIG, and mutual connectivity and reliability with various types of PCI Express interface have been confirmed. Supports lane numbers ×1/ ×4/ ×8. AMBA3 I/F selectable for user interface. LINK macro interface compliant with the standard regulation PIPE3/PIPE4.